Make your brand go viral with giveaways. A Leaderboard Giveaway is a contest system where audiences are given incentives (gifts and prizes) for completing certain tasks that will lead to increasing your reach (sign up to your email list, invite others to subscribe to you, etc.). They are a great way to increase your audience reach with absolute minimum effort. A giveaway done correctly can increase your email subscriber count and Social Media Followers in a matter of days. 1. Brainstorm with your team on some lucrative top prizes to increase giveaway participation. 2. Brainstorm a set of cheaper gifts and prizes that users can unlock after they complete a certain no. of tasks. This incentivization will lead to more engaged participants, completing more tasks. 3. Select and finalize on all the tasks that the giveaway participants need to do. We will brainstorm with your team to conclude all the growth goals you want to achieve. 4. 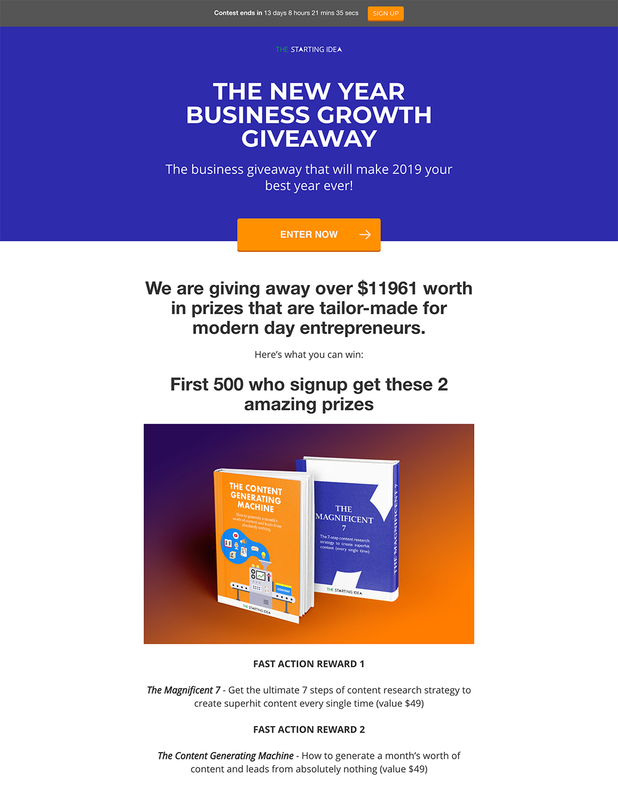 Create a beautiful dedicated landing page for the giveaway listing all the prizes, complete with copywriting persuasion tactics to motivate audiences to participate. 5. Create Social Media Creatives for the giveaway, showcasing all the prizes with eye-catching copy and design. 6. Launch the giveaway to your email list. 7. Write a series of emails that will be strategically spaced out and sent at regular intervals throughout the duration of the giveaway. 8. Make the giveaway page as the thank you page for anyone who signs up to your website. 9. Create a giveaway section in your main menu, so it is unmissable to any site visitor. 10. Create a special side pop-up advertising the giveaway on your site. The pop up will come with a timer (counting down the days till the end of the giveaway). 11. Advertise the giveaway on your social media cover images. 12. Pin the Giveaway on Twitter and Facebook brand handles. 13. Submit the giveaway to special giveaway dedicated websites. 14. Submit the giveaway to various social media groups where direct posting is allowed. 15. Add the Giveaway link to every email you send via your newsletter. 16. Run FB ads for the giveaway and advertise it to your ideal target audience.